With 8 races remaining in the 2010 NASCAR Chase, Jimmie Johnson is sitting right where he wants to be...and where the rest of the field hates to see him. Jimmie is second in points with 8 races remaining. Since the points system has been implemented, Jimmie Johnson has dominated the NASCAR series winning the cup in each of the last 4 seasons. Let’s face it…it’s almost like Jimmie was consulted about the change in the points process before implementing the Chase and Jimmie made sure the new process favored the California native. Ok…so that’s a stretch, but how can anyone deny the fact that the new points system has turned Jimmie Johnson from a great new up and coming driver into a future hall of famer? He has been the dominating force in the new points system and the attempt by NASCAR to mix things up a bit this year by modifying the final points system for entering the chase did little to change this trend. 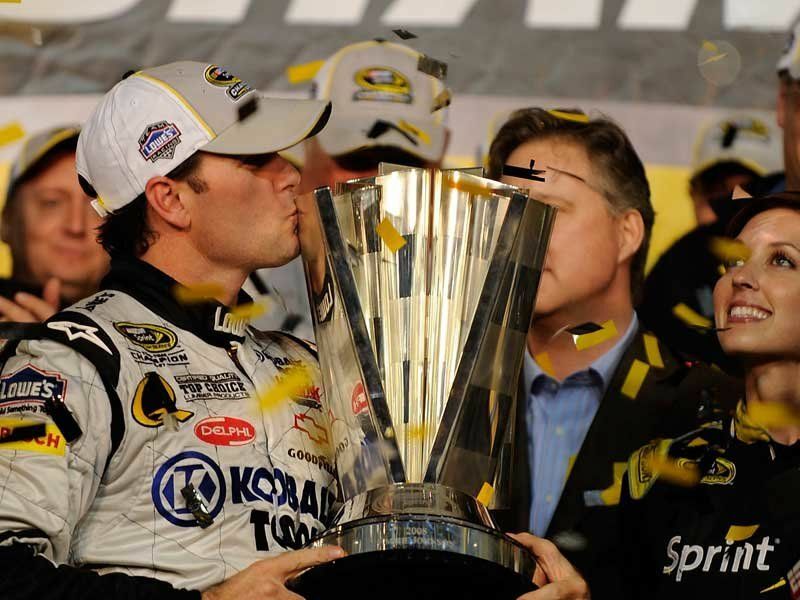 Jimmie has won at least three of the final eight races in the last three NASCAR seasons. He is sitting right where he wants to be with 8 to go and it will be a miracle if Denny Hamlin can hold him off, and as equally surprising if anyone in the pack can close the gap and catch Jimmie. NASCAR should just start engraving his name in the record books now. The interesting byproduct of another Johnson championship will be how it affects the already “interesting at times” relationship with car owner and team mate, Jeff Gordon. Jeff was “The Man” when Jimmie entered the NASCAR scene as a full time driver in 2002. A win this year by Johnson will put him past Gordon on the all time championship list with five titles. Only Richard Petty and Dale Earnhardt have more with seven championships each. Regardless of the final standings, tensions are sure to be high in the Hendricks Motorsports camp. Will this be the beginning of an inner team rival? That’s hard to say, but all of us here at Rivalry Rage love the sports trash talk that another win by Jimmie Johnson will create.